Bullet after bullet, death after death, every mass shooting in the United States sparks nationwide sorrow, shock and Twitter prayers. With each massacre comes the rekindling of the everlasting gun control debate, which historically results in little action and tends to dissipate until the nation’s next tragedy. Following the deadly school shooting at Marjory Stoneman Douglas High School in Parkland, Fla. last month, several survivors have attempted to spark gun action by calling on lawmakers to pass stricter gun regulations in hopes of preventing another similar incident in the future. These pleas for change have resulted in discussions on gun reform, from Florida governor Rick Scott signing the “Marjory Stoneman Douglas High School Public Safety Act” to President Trump suggesting teachers should receive training on how to handle firearms and be armed on school grounds; Missouri legislation seems to be moving in the direction of the latter. House Bill (HB) 1942, first introduced by Rep. Dean Dohrman (R) in January before the shooting, is under debate by Missouri lawmakers. Dohrman said the bill would allow any full-time faculty member at a university in the state of Missouri to volunteer as a “campus protection officer” who would receive extensive training to carry a concealed firearm on campus. 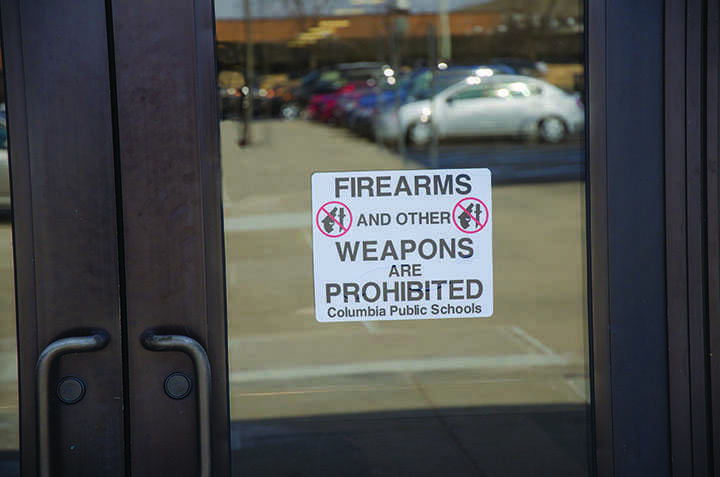 While University of Missouri-Columbia (MU) professor Lael Kaiser doesn’t think the bill will diminish campus protection, she doesn’t think it will be able to prevent a mass shooting, as a faculty member likely won’t be able to harm an active shooter quickly enough. She expressed her concerns on the possible dangers that could come with having several armed persons on campus. If the bill becomes law, it won’t be the first time faculty members are able to carry weapons on state campuses. In fact, a school district in Missouri, the Fairview R-XI district in West Plains, has been training and arming teachers with firearms in their school since the 2012 Sandy Hook Elementary School Shooting. Currently, it has multiple schools with teachers trained and armed with concealed firearms. National media organizations like Fox News and The New York Times have recently shed light on the district’s firearm training. Aaron Sydow, superintendent of Fairview R-XI, explained that teachers receive rigorous training from a combination of numerous groups, including the local sheriff department, a SWAT team and Shield Solutions LLC, a Missouri-based company that specializes in school security. Teachers learn the basics of operating a firearm before they engage in live fire drills, ranging from clearing buildings and parking lot scenarios. The district initially debated hiring a school resource officer but later decided that an undisclosed team of teachers would be a better option for campus safety. RBHS students, though not in college yet, are aware of the implications this bill can have on their futures and other Missouri schools. Two juniors, Caiya Marshall and Sam Smith, have exact opposite views on the bill and on how schools should implement school safety. Marshall sees the bill as unsafe while Smith views it as an opportunity to protect more students. On the other hand, Smith said as long as teachers are comfortable with handling a gun and using it if a scenario ever occurred, he would be for arming teachers. While Sydow said it was unfortunate that school safety has come to arming teachers for security, he believes it is a strong way to counter a school shooter.